Lee Gil-Rae graduated from Kyunghee University after studying in the department of art education, later going on to gain his Masters in the discipline of Sculpture. For twenty years, Lee used nature as his muse and crafted sculptures from steel and copper pipes. 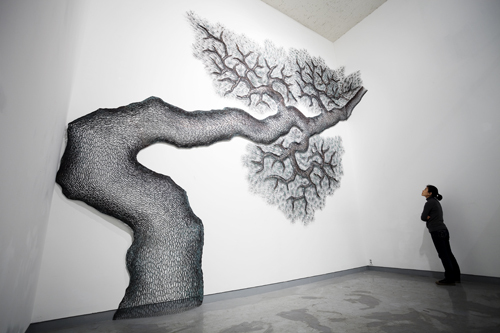 With rapid deforestation, Lee Gil-Rae's trees narrate the artificial nature that city dwellers so closely identify with. The man-made and constructed simulation of nature is apparent in all towns and cities. Nature is removed and confined to make room for the ever-expanding population. Lee Gil-Rae has participated in several exhibitions in Korea, America and Japan and features in numerous permanent collections. He constructs enormous forests of copper, capturing this rapidly depleting resource for eternity. In his persistent need to create organic forms Lee Gil-Rae takes it one step further in creating man-made nature. 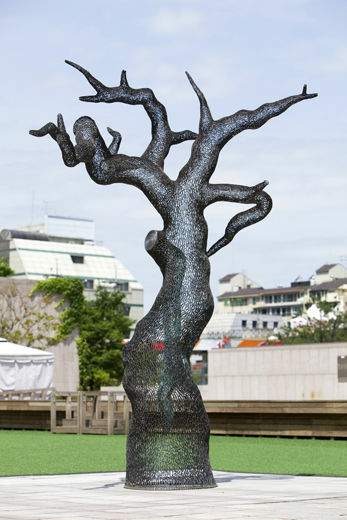 His works consist of surreal, leafless forests that one can meander into, with spiralling branches that are unnatural in structure but organic in aesthetic. These draw the viewer in to witness the intricate exteriors that mimic the curves and notches of aged tree bark. His sprawling branches fan out and are tipped with wisps of copper representing the needles of the pine trees, in true homage to Mother Nature. The working process of connecting copper pipe media is much like adding touches of brush strokes to Oriental paintings. The moulding process is symbolic and important, and trees which are strong and full of vitality, even in barren land, have to be broken down into their fundamental shapes and natural states. The copper pipe material resembles the texture of tree bark and the meeting of exquisite shapes in his sculptures transform the physical properties of plant life into modern, mechanical forms. His other subject matter has included abandoned castles, archaeological excavations, creation, and cohesion. Lee Gil-Rae has participated in several exhibitions in Korea, America and Japan and featured in numerous permanent collections. My concept for the Tree Series is to depict trees at their strongest and fullest vitality. It can be said that the shape of trees as natural objects expands one's vision of nature and an Oriental mise-en-scene is created through the laborious and intensive weaving process.